This will be a review of the hair supplement BioCorrex Regrowth and Volume. This is a supplement that is specifically created with women in mind. It is promote and maintain healthy hair while actively combating hair loss. Please continue this review to see if this item is ideal for you and your hair needs. The manufacturer also clearly states this product does not contain: wheat, gluten, filling agents, yeast, dairy, GMO, preservatives, sugar, fructose, glucose, synthetic or artificial sweeteners, artificial flavors or colors, or talc. The dosage is 2 capsules daily after a meal. The time of day does not matter. The company also suggests massaging the scalp in order to boost and stimulate hair growth and the supplements benefits. They also make sure to state that those who are not comfortable with swallowing the capsules can open the capsules and the contents inside can be mixed in with food. This is not recommended for pregnant women and the manufacturer warns not to exceed the suggested dose for safety concerns. This is a very expensive product. A 30 day supply will run you $94.99. They do offer consumers who wish to buy in bulk a discounted price. The more units purchased in bulk the higher the discount. However there is currently no discount for the the single unit of this product. The company justifies its price with a comparison between its product and other similar supplements on the market. There is a possibility for the consumer to get a full refund. If the item is returned within 14 working days after purchased, they will be able to get their full refund. The manufacturer specifically states the item needs to be unused and in its original condition. This is not ideal or an effective way for a consumer to try out the product. There are generally positive reviews on the website, many stating the product takes some time to work before results can be seen. 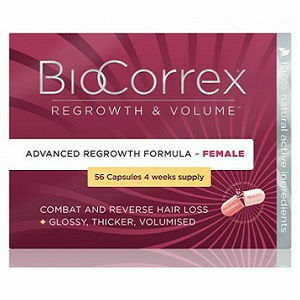 The BioCorrex Regrowth and Volume the Female Hair Supplement description on the website is extremely detailed. The potential consumer is able to see what the exact ingredients are before they decide to buy. The ability to purchase a bulk order may be appealing to some, especially with the discount that is attached to it. Some of the negatives for the product are its price and also return policy. If a consumer is unsatisfied with the results or the product, there is no guarantee they will be able to get their money back. The fact that this is very highly priced with an inefficient guarantee is something to take into consideration. While the reviews are positive, it doesn’t mean this will work for everyone. John Brownstone	reviewed BioCorrex Regrowth and Volume	on July 28th	 and gave it a rating of 2.5.